Both my sons are huge Lego Star Wars fans. For Halloween we made them homemade star wars lego costumes that were so awesome and we decided to keep within the theme of this year and go with Lego Star Wars. This was only a One hour Party (thank goodness). 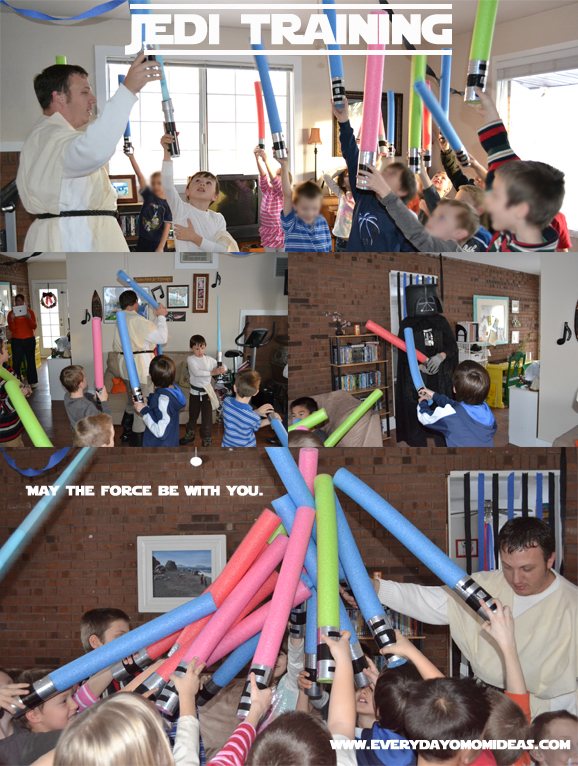 Instead of games and prizes we decided to do something a little different and more memorable... a Jedi Training Course! While the kids were waiting for the rest of the guest to arrive we had my sons collection of star wars lego pieces out for the kids to stay busy and entertained. We also had a playlist of Star wars music playing in the background. Then when we were ready to get started we told the kids that they this wasn't a birthday party and they all were so bummed out. Then I said "You each have been chosen to become jedi and must be trained in the ways of the force and prove you have what it takes to be a jedi and defeat the dark side!" Then my Husband took the kids into the family room where the furniture was moved out of the way so there was enough room. Then we had the Training lesson, than cake and ice cream, opened presents and let them loose outside with their new light sabers to go at it until their parent came and got them. What is really cool is that the kids were all talking about it at school the next day and I had parent coming up to me all week saying how much their kids keep talking about the party. 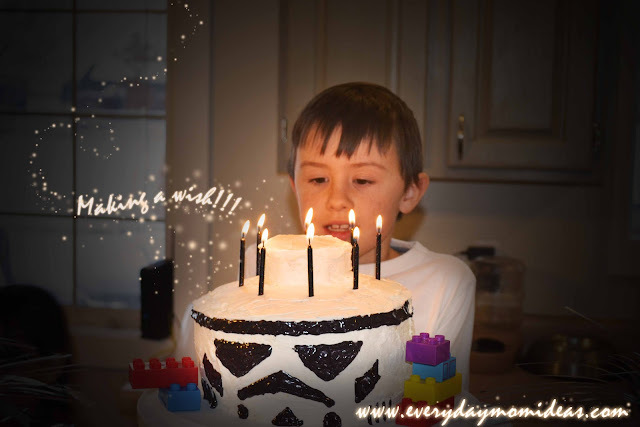 My son has been going through some issues at school lately and he has been feeling like he doesn't have a lot of friends and so this party couldn't have come at a better time and did wonders for his self esteem. This was a lot of work but it was so worth it and so much fun and I know he is going to remember this for the rest of this life. These cards were so fun to make. I loved getting to work with all this fun typography and challenging myself to come up with a modern design while still sticking to a Star Wars Lego theme. 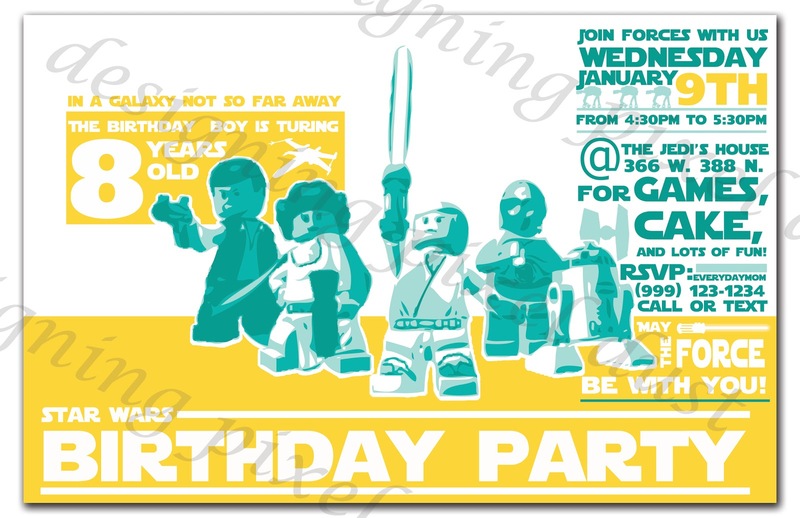 You can order these Personalized Invitations just by emailing me at everydaymomideas dot com These are available as a digital design for only $15.00. They are fully customizable for no extra charge. You will receive your custom digital invitation design in a pdf.file format to print as many as you want. The Free printables for everything is at the bottom of this post in an easy to use pdf. 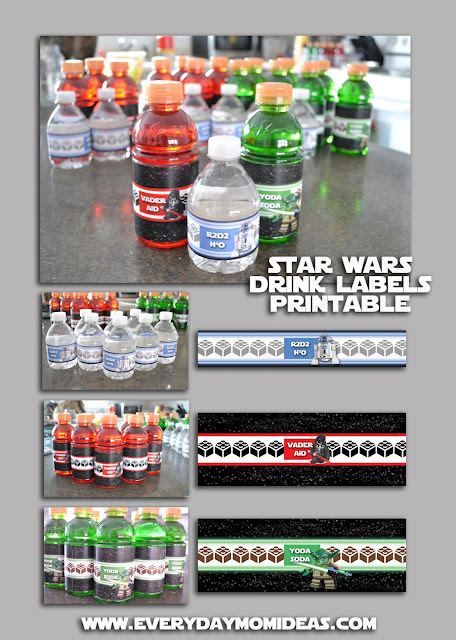 These drink labels fit the mini Gatorade bottles and the super mini water bottles. When you cadets have finished their Jedi training they can then receive their Badge. Just print and cut these out and then whole punch the top. Use ribbon so they can wear it around their necks. I tried to look for lego star wars cake tutorials that were easy and I just couldn't find any at my low skill level, and without using yucky fondant. So I had to come up with my own. 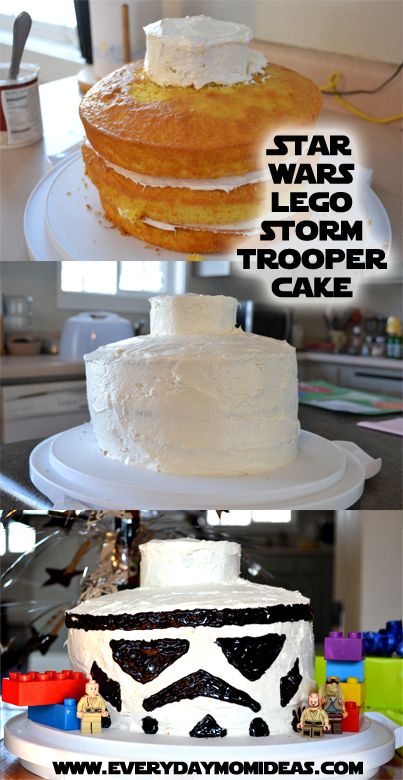 Here is my truly original cake tutorial... Im so glad it actually worked. 1. This is a three in a half layered cake. Bake both cakes as directed in the round cake pans. If you only have two cake pans like me you are going to half take turns getting all four baked. 2. Freeze one of the round cake pans for four hours or over night. This is so you can Carve the circle for the top without the cake falling apart. 3. Once the top little cake is carved using a knife, go ahead and layer and frost the cake. 4. Add the designs with black tube frosting and your done. 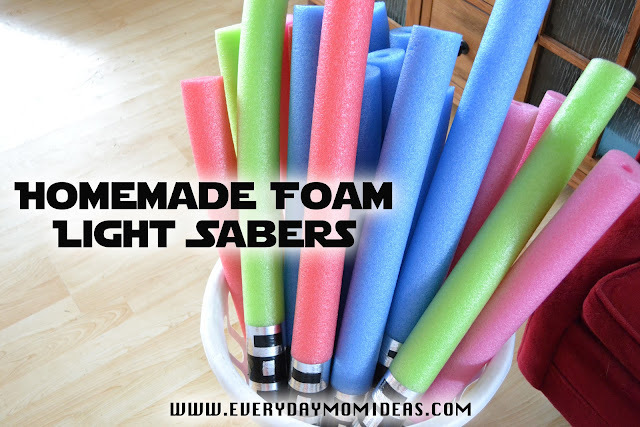 These light sabers are really easy to make out of swimming pool noodles, and make a great party favor. You can find them at the dollar store during the warmer months but if you have winter babies like me the best place to find them is Amazon. Cut the noodle in half and then dress them up with black a silver Duct tape at the handle. To do the Jedi training check out this youtube video of the disney land version (be sure to check out part 2 as well). My husband and brother watched it a few times ant then practiced it once or twice before the party to kind of give them some ideas on what stuff to say. The Jedi Training is really fun and simple. It can get crazy so remember to just have fun with it and make it your own. 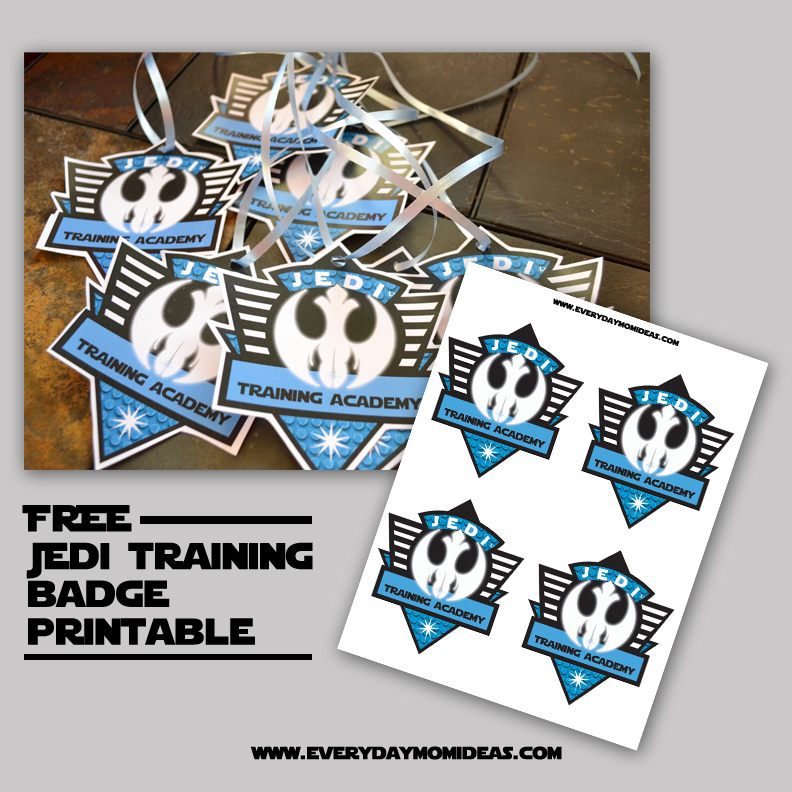 DOWNLOAD FREE Star Wars Printables Here via Google Docs! If you like this post please leave a comment and/or share, pin or tweet about it! 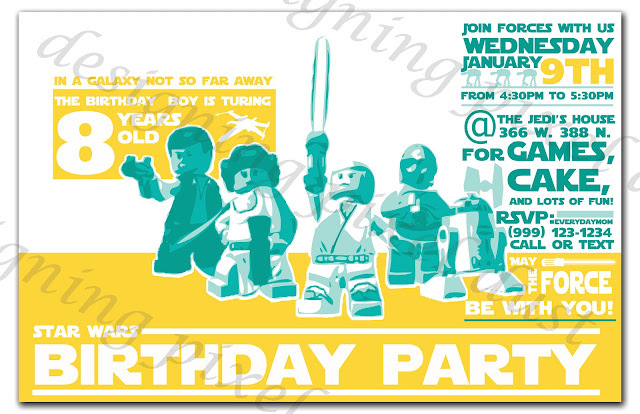 I'd love to see your Star Wars Lego Party. Feel free to send me links and/or pics of your party and I will post them on my next "What you've been up to" post! thanks so much. My boys are all star wars fans and I am always on the the lookout for new ideas...since we will be having more star wars parties in the future!! Love these ideas! It seems you had a great fun with “Lego Star Wars” theme also the pictures look so nice and the costumes are incredible. expect to work with powell as crewe rule out 4m star returning on loan. task can be completed in a matter of seconds. This means you sign over rights in your property towards the lender payday loans online you'll find that sometimes the client who claims to provide the greatest price over the phone will end up actually paying you a lot less. Oh no! Scribd is now pay to play and I can't get to your pdf. Would you be willing to post the file or email to me? Thank you. I had the same issue. Only I paid the money for Scribd and couldn't get it. Could you e-mail it to me if you have it? Can you please help? I have spent an hour trying to get these labels. I downloaded some sort of software and then paid $8.99 for Scripbd and couldnt find it on there. I ve paid the money and would appreciate access to these labels...PLEASE. scrbd isn't even letting me log in to get my own uploads. Let me see if I can find the original files on my hard drive. It might take me some time to locate them. Hi! do you find the printables? 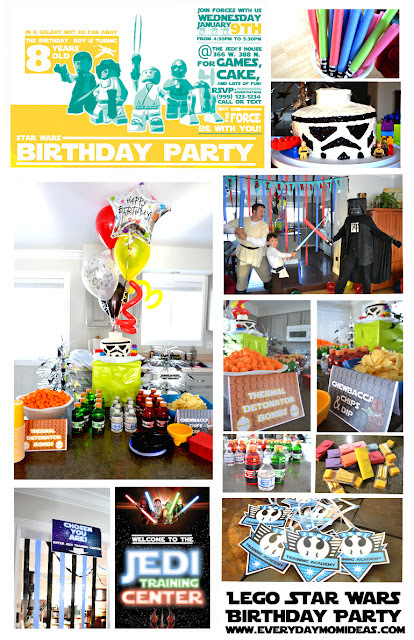 my son party is on September and i´ll love to use all these amazing ideas. Thanks! I can't find these bottle labels :( help please!! Were you able to find the originals? Party is tomorrow? Your lego star wars party looked great! I am having one for my son and came across your site. The training badges are spot on and the welcome to jedi training is really cool, but I cant print them as they have been removed from scrib. Any way I can access them? I have now uploaded the designs to google docs for easy access and no fees.